29.06.2013. First time I have tasted a Georgian wine was in my first wine class, “History of Wine” taken on Fall 2012 at Chaplin School of Hospitality with prof. Bill Hebrank. As we went throughout the history of wine in class we were able to taste wines from distinct countries that you would not usually have the opportunity to do so, not because they are not available on the market, but because they are not familiar to us and unfortunately most of us try to stay on the safe side while experiencing new things, in particular wine, where it might not seem complex at first but it requires more information that you might be willing want to know. This past Friday, 06/21/13 we had the opportunity to taste 6 Georgian Wines. It was an experiment conducted by Clark Smith and his assistant in Miami-FL, Nicole Linares to introduce these wines to the “American palate”. Note that our tasting group consists of every nationality, not only Americans, as you would imagine in South Florida. Clark Smith is one of the teachers for the Wine Program at FIU. He spends most of his time in California but nevertheless he has an amazing partnership with The Chaplin School of Hospitality and Tourism Management. 28.06.2013 (Hvino News). According to the Russian media, counterfeit Georgian wine has been found in Moscow. An article printed in the Novaya Gazeta suggests that Russia might once again place an embargo on the imports of Georgian wine produce due to the counterfeiting. The publication states that bottles without excise marks were discovered in a number of stores, mentioning brands such as Saperavi, Khvanchkara and Kindzmarauli. Russia’s Sanitary Service will take strict measures if counterfeited or substandard wine or mineral water from Georgia is revealed in the Russian market, said Gennady Onishchenko, head of the watchdog agency Rospotrebnadzor. "Everyone remembers the situation due to which we took radical measures several years ago. If this situation persists, our steps will be even tougher, "- said the Chief Sanitary Doctor. 26.06.2013 (Hvino News). The American company Optima Group Inc., represented by Eristavi Legal Group in Georgia, started a lawsuit against brandy producer JSC Sarajishvili. Optima Group plans to hold a press conference on this issue on June 27 at 11:00, at Interpressnews agency in Tbilisi. 25.06.2013 (Hvino News) The bank VTB (Georgia), VTB Factoring company, and Georgian wine producer Kindzmarauli Marani have signed a tripartite cooperation protocol concerning a pilot factoring deal limited to some $2 million, news agency Interfax reported from the signing ceremony today. Note that the Russian news agency's English site erroneously reports the deal at $2 billion instead of $2 million. The incorrect information was reproduced by several other media, who quoted Interfax. VTB (Georgia) will provide financing to Kindzmarauli Marani and VTB Factoring will assume the risks of the Russian borrower. VTB (Georgia) and VTN Factoring are affiliated with VTB Group - one of Russia's largest financial institutions. Kindzmarauli Marani is a company based in Kakheti, which owns up to 500 hectares of land, including 435 hectares under vineyards. The current range of products of Kindzmarauli Marani includes 23 wine brands, including red dry Samepo Kakhuri (Kakhetian Royal), white dry Samepo Kakhuri and naturally red semi-sweet Kindzmarauli Original. 25.06.2013 (Hvino News) The President of Georgia attended Kartli Wine Festival 2013, which was held at the rehabilitated Castle District in the Georgian town of Gori. Mikheil Saakashvili spoke with winemakers and noted that such events will assist popularization of the local wine, which will give farmers more income. In June Euromonitor International published researches "Wine in Georgia", "Spirits in Georgia", "Alcoholic Drinks in Georgia"
25.06.2013 (Hvino News) In June 2013 Euromonitor International - leading provider of business intelligence - has published several research reports on Georgia's wine and spirits industry: Wine in Georgia, Spirits in Georgia, Alcoholic Drinks in Georgia. According to abstract from Wine in Georgia, "Bulk wine continued to dominate the wine sales in 2012 as a result of its relatively lower unit price while offering reasonable quality. The majority of bulk wines sold on the Georgian market are still white wines. 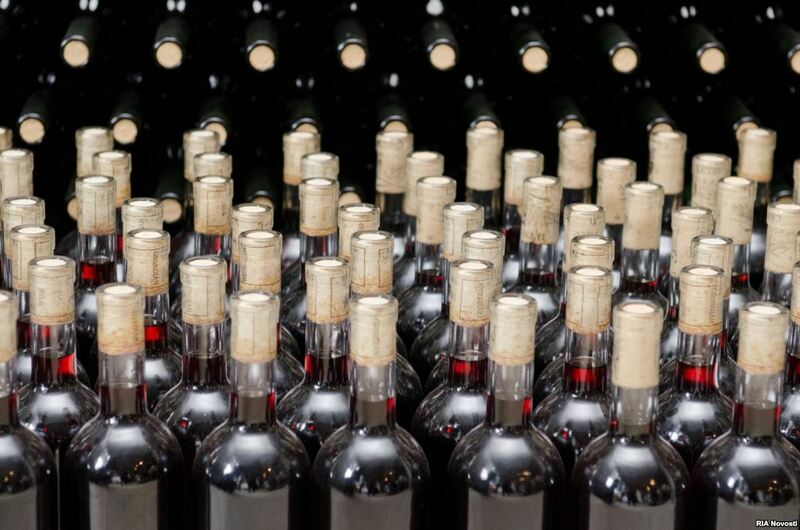 When it comes to bottled wines, the sales are dominated by several large local manufacturers, such as Telavi Wine Cellar JSC, Tbilvino JSC and Telliani Valley Plc. The Georgian wine market is expected to continue developing at a fast pace over the forecast period, further fuelled by the growing tourism inflows in the country. The number of smaller chateaus and guesthouses, which produce wine for their foreign guests, is expected to also increase in future, at the expense of the larger wine producers which concentrate on the production of economy brands for local consumption. A good example of such a business model is Chateau Mukhrani, which is located near the capital of Georgia. At the same time, it can be expected that with the changes of generations, domestic wine making for home consumption will decrease, as younger Georgians are not keen on making their own produce, rather than buying re-bottled wines". 24.06.2013 (Hvino News) Three Georgian wines were featured in the list of "Sommelier Favorites From Eastern Europe" published by Wine & Spirits Magazine, after its annual Wine & Spirits Top of the List Tasting 2013. 23.06.2013. They may not be top of mind when it comes to wine-producing nations, but smaller players like Turkey, Lebanon and Georgia are being described as countries to watch at the largest wine and spirits fair in the world. The common denominator that these countries share is their prime growing conditions, say experts at Vinexpo, which was happening in Bordeaux, France, last week (read more here). Georgia, for example, produces a marginal 25 million bottles a year. 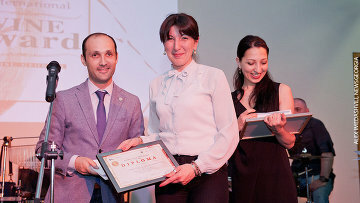 But despite the small output, the country’s ideal geographical location (it borders the Black Sea, Turkey, Armenia and Russia) and the quality of its soil have helped Georgian wine producers snag top prizes at international wine competitions. Vinexpo organizers point out that Winery Khareba, for example, the largest producer with an output of 9 million bottles, took home a gold medal at the World Wine Competition in Brussels [correction: at Concours Mondial de Bruxelles in Bratislava - HN] recently (read more here). 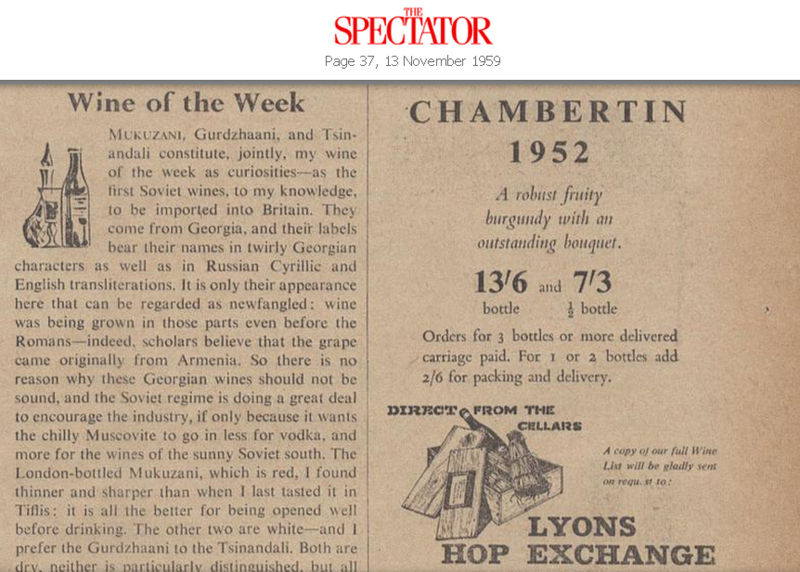 'Wine of the Week', The SPECTATOR, 13th November 1959. 23.06.2013. Another nose in the Spectator digital archives, and this time it a 'Wine of the Week' from November 1959. History is a fantastic pursuit because it is always unveiling those plus ça change, plus c'est la même chose moments, the ones that make you wonder whether we're all just going round in circles. 22.05.2013 (Hvino News). 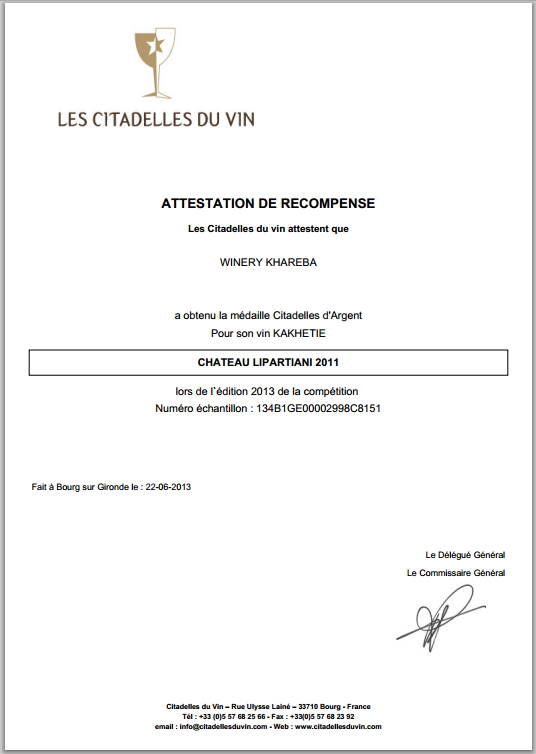 Dry white wine Chateau Lipartiani 2011 from Georgian producer Winery Khareba has won silver award at Citadelles Du Vin wine contest in Bordeaux, France. Citadelles Du Vin is a prestigious wine competition organized during the Vinexpo exhibition. Every May some 40 top level tasters from all over the world meet in Bourg (Bordeaux-France) for three days to elect the best wines out of 800 samples coming from about 30 countries. 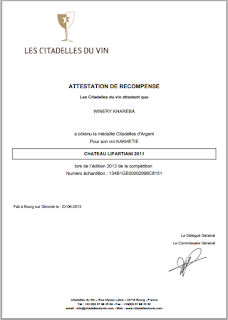 The contest has now attained a significant level of samples and international recognition (70% of foreign wines), making The Citadelles du Vin one of the key competitions of the world. In 2013, the award ceremony and the promotion of the prize winning wines took place during Vinexpo, the very influential international wine and spirit exhibition held in Bordeaux on June 16-20. 22.06.2013. If there's one export that encapsulates the spirit of Georgia's turbulent relationship with Russia it is wine, as Giorgi Margvelashvili, 39, knows all too well. Together with his twin brother he runs Tbilvino, the country's largest exporter of Georgian wine. As he walks through his company's cavernous wine cellar in Tbilisi, Giorgi beams with pride, but his is an industry that has been through tough times. Seven years ago the Georgian wine industry was decimated when Russia placed an embargo on imports of Georgian wine, barring it from its largest market. 21.06.2013 (Hvino News) The first batch of Georgian alcohol in years was cleared at Alabino customs post in the Moscow region on Thursday, Russian news agency Interfax reported. "After the alcoholic products arrived at the temporary storage facility officials from the Federal Service for Consumers Rights (Rospotrebnadzor) conducted all due procedures to check the quality of the products. By now the customs clearance of the cargo has been completed, and the first declaration was issued for alcohol produced in Georgia," a customs official said. 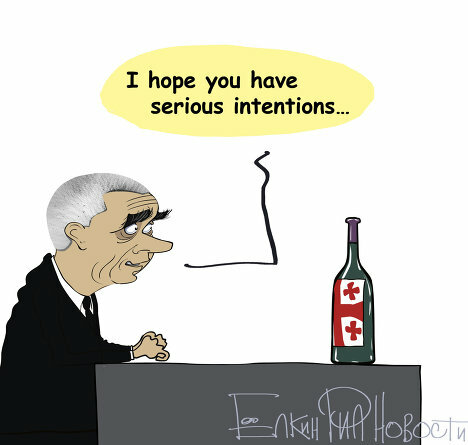 Earlier head of Rospotrebnadzor, Russia's Chief Sanitation Doctor Gennady Onishchenko said that the first batch of Georgian wine would be cleared at a customs post in Moscow region on Thursday, June 20. More than 20,000 bottles of Georgian brandy have also passed through customs procedures in the Moscow region on Thursday and were released onto the market, the customs authorities said. Together with the brandy, more than 100,000 bottles of alcohol also cleared customs. A total of 1.5 million excise stamps for Georgian alcohol products have been distributed by the customs authorities, Interfax reported. Gennady Onishchenko said the arrival of Georgian alcohol would bring back warm memories for older people, though the 20,000 bottles "wouldn't even suffice for a decent banquet to celebrate the opening of the border." 19.06.2013 (Hvino News) The return of Georgian wine to the Russian market concerned the Armenian winemakers. 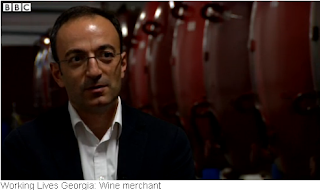 Avag Harutyunyan, president of Union of Armenian Wine Producers, stated that due to Georgian wine exports to Russia, the Armenian wine had problems on the Russian market. "There are several factors. We occupied a certain place in the Russian market in terms of prices. Now the Georgians came to this niche. Since 2005 they have got out of the low-price niche and now want to occupy the high-price niche. This demonstrates that the Georgian wine quality has improved", - he said [more detail here (in English) and here (in Russian)]. "The notion of "Armenian wine" is strange to me" – Zurab Ramazashvili, head of Telavi Wine Cellar (Marani) responded to the president of Union of Armenian Wine Producers. According to Mr. Ramazashvili, Georgian wines are of much higher quality than Armenian products and, hence, will be presented in the higher price segment in the Russian market than the Armenian wine now. Ramazashvili says that Georgian wines are preparing for competition with high quality wines and not with Armenian products, which, in his words, occupy insignificant place in the Russian market. He adds, the Armenian and Georgian wine is of a very different quality and different price segment. "I know Armenian brandy. It definitely has a certain niche in the market, but Armenian wine can be rarely found on the shelves, "- Ramazashvili noted.